A hole-in-the-wall store on Commercial Street, Ritz Shoes, will add plenty of vibrancy to your shoe rack with their kolhapuris and jootis. Plus, the price tag will please you. 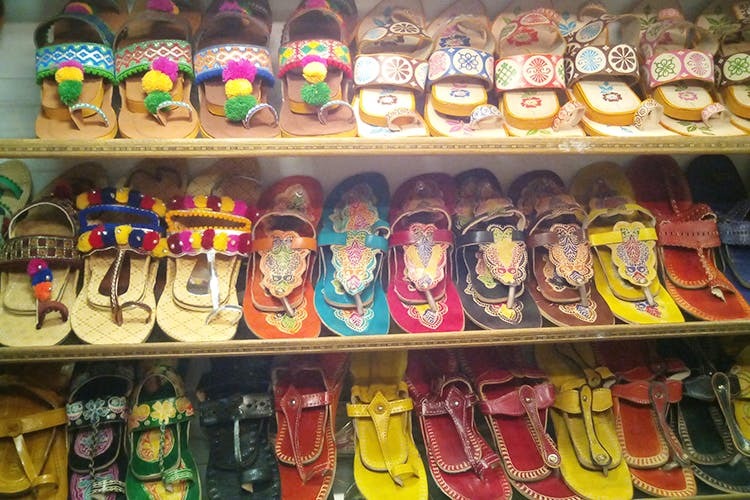 Popular with the crowds, Ritz Shoes is located just a few shops down from Shiv Sagar. It’s not much to look at and the space is tiny. But that shouldn’t stop you from checking out their collection. Priced between INR 280 and 350, these will make your wallet smile as well.The front of the shop is adorned with strings of hanging jootis. These are mostly of the plain, tan variety with simple designs imprinted on them. On the doors, you’ll spot more colourful choices — in bright yellows, red, and blues. But if you are looking to jazz up an outfit, we recommend you step in and check out the ones with thread work and also some that are lined with small bells. Plus, there are the gold and silver ones. Much of the collection is made up of funky varieties of the Kolhapuris. The classic chappal is spruced up a bit here and they’ve added trinkets to it. Then there are the beige ones that are decorated with colourful flowers. The more boldly coloured ones also sport intricate patterns and beadwork on them. The offerings at Ritz are much more sturdier than the other stalls iin the vicinity. However, don't expect them to last forever.